For as long as I’ve been a reader — that is, as long as I can remember — I’ve felt a strong connection between books and food. From the perfect pastel ice-cream cones enjoyed on a summer’s day by Babar the Elephant and his family to the wickedly mysterious cubes of Turkish Delight perched on the glistening snow of Narnia, food has the power to anchor magical settings in reality by reminding us of the appetites we share with even the most uncommon characters. And, of course, there’s the pleasure of eating along with your favorite characters (or, alternately, the noshenfreude of snacking on something delicious while reading about the awful travel rations that heroes on quests usually get stuck with). 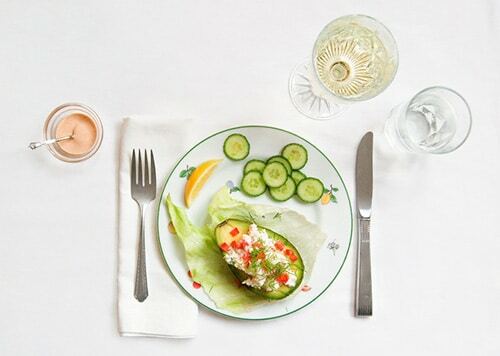 In Fictitious Dishes, Dinah Fried channels those foodie feelings by photographing 50 famous literary meals. Dishes has a very simple layout: for each two-page spread, the left side includes the title of the book, a tiny illustration relating to the book (don’t overlook these, they’re clever and charmingly done), and a short passage describing the meal in question, along with a few bits of random trivia. The right side is a full-page photo of Fried’s recreation of the food, often involving backgrounds and props that reference the source book. Some are mouth-wateringly appetizing or beautifully lavish, but others are starkly simple or downright off-putting, like the pile of rotting food that represents The Metamorphosis. To be sure, this is one reader’s passion project about books that have spoken to her. It’s an artistic interpretation rather than a slavish recreation of the exact words on the page, which has drawn the ire of faithful readers with a gimlet eye for detail. The tableaux were assembled over time, using items scrounged from thrift stores and flea markets, and photographed with a kludged-together array of photo lights and household lamps. So while the photography might not be of the same caliber as the lusciously styled images in glossy food magazines, it’s clearly a labor of love — and an absorbing, intricately detailed study. I enjoyed seeing another person’s take on iconic literary meals that I too had imagined in my mind while reading, even if it didn’t match up precisely with my vision. You’ll probably be passingly familiar with most or all of the books featured in this collection, but Fried includes short summaries at the back in case you want to learn more about any of them. You can see sample photos at the Fictitious Dishes website. 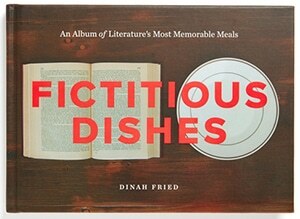 A fun addition to the coffee table or gift for your favorite literary foodie, Fictitious Dishes is sure to whet your appetite for reading.